In den Erzählungen über Konfuzius, im Lunyu, wird berichtet: „Zigong fragte, ob es ein Wort gebe, an das man sich das ganze Leben hindurch halten könne. Der Meister sagte: „Es heißt wohl shù." We need to develop our extrasensory awareness to heal sustainably with plant medicine. Cannabis offers sustainable healing when you decide to let the truth of the discomfort guide you instead of intending for a bypass to peace. This is a crucial key to why the potential of cannabis is so widely unseen in habitual use. Cannabis has surface benefits. They easily lead to a point of saturation that silences the discomfort of illness and reality instead of illuminating it. The healing piece of ego dissolution is missing here. When that is truly happening, chronic saturation of cannabis is not medicinal. (Pun intended, keepin it light). I went on a journey with cannabis last night. I didn’t ingest. I followed the plant’s energetic signature in real-time. I got a clue to observe habitual saturation concerning blockages to ego dissolution (healing) through perpetuation of victim consciousness. In how the grid of the plant is tapped by an energy of ‘political correctness’ which keeps one from experiencing potential wholeness of cannabis as medicine. I could write a thesis with this info, and am going to repeat myself in a few ways. FINDINGS: Cannabis inspires the critical self-inquiry process that leads to ego dissolution (healing) up to the point of [over] saturation which can only be realized by Self or ego in their relation to the natural world. Daily saturation through ingestion didn’t use to be seen as an acceptable medicinal protocol, or how cannabis works as a medicine at all. It didn’t happen this way before pharmacy. People had fine-tuned extrasensory abilities, and were better able to communicate with the plant and natural world. In times before this numbing to pain, we knew how to truly connect to the plant, to work with it, instead of siphoning its surface - or designing genetics - to pacify symptoms in benefitting escapism. In this case, escapism is an exhaustive or habitual usage that removes the inherent struggle of ego dissolution necessary for sustainability in a healing process. From here, cannabis is no longer a sustainable healing. This can easily trigger. Yes, people are receiving wonderful things and physical bandaids which adds up to momentary better qualities of life. However, I’m talking about sustainable healing with cannabis in fuller potentials. Nowadays, people are thinking they are communicating with cannabis when they are only scratching the surface of the plant. With political correctness, dependency and escapism has become acceptable as a form of healing. Victim consciousness has become acceptable. We say, it hurts too much to look at it. I have anxiety. I can’t face it. Experts say, that’s fine! It’s not your fault that happened! You don’t need to do anything else. Here’s a remedy! Classic pharmaceutical protocol made us forget what medicine is all together. Medicine is ego dissolution: the true healing of any illness. A medicine of cannabis caliber, that offers sustainable healing, doesn’t work by softening the blow of illness, or providing a ‘cover-up’ for pain or anxiety when it is habitual: time and time again. It works by intensifying the struggle with guidance for Self from the plant which soothes in ripples of dissolution: the integration. Healing needs self-inquiry. In the age of protocol conditioning, the surface effects of cannabis have been exhausted to the point of dependency and numbing: a looping trap in healing for those not [knowing how to] honoring uncomfortable symptoms of extrasensory development (like anxiety or mismanaged empathy). We have moved into seeking brief moments of enlightenment that are unable to be reached without ingesting. We aren’t doing the work. When enlightenment works, it’s embodied. Intelligence merged. Cannabis is being treated and taken like a prescription drug! Do you see? If a plant that is not food is called medicine yet it is needed constantly, there is a facet of victim consciousness (disempowerment) in the usage. It isn’t wholeness in healing due to a limited relationship with the natural world that stems from perpetual escapism of the struggle. It’s a cycle! We have a reciprocity with plant medicine that makes it sustainable healing when we learn to forgive our external and internal. Victim consciousness is perpetuated when we don’t forgive, or allow ourselves to dissolve to the point of merger with the perpetrator. We instead tell ourselves: we are ok, we are surviving, ‘they’ are against me, and there is hope and inspiration in a world [that doesn’t serve us/me] over and over. When we band-aid. The forgiveness is an acceptance of the uniqueness in the web. An acceptance of how it has all played out. It leads to a ‘merge’ or oneness with the catalyst of trauma and the struggle inherent afterward. It isn’t a dismissal of duality, but an acceptance of it. The healing is taking place through integration of that oneness experienced while ingesting. Forgiveness in this way is NOT a dismissal of the perpetrator or behavior. It is a natural dissolve into not taking it personally. This happens in everyone’s own time, of course. It is not necessary. I’m not saying people need to do this if they aren’t called. But when you are, here’s some info. I’m sharing as I’ve had an influx of questions in the last week on my opinions. I’ve been rather quiet - realizing I was silencing my struggle to share in this politically correct world. And that this is only opinion. To connect to the plant beyond its surface benefits, I highly recommend to learn what it feels like to connect without ingesting. Not ingesting yet receiving connection will retrain your cells to an extrasensory body that communes with cannabis in its potential: a medicine that offers dissolution, or sustainable healing outside of the looping function. For when you do ingest again, you can do it with a renewed purpose. "This takes extrasensory awareness. What does cannabis feel like without ingesting it? This could need a detox in ingesting to become attuned to; however, learn that through sitting in openness and receptivity with the plant (doesn’t need to be there in the physical but helps to begin). Sitting means calling the holistic frequency of the plant into your awareness as best you can, starting a conversation of sorts, and observing from many perspectives; in oneness and duality. People ingest just to ingest which is surface benefit. Ingesting with intention adds an extra depth. Sitting with the plant without ingestion yet with the intention you would have starts the process. When we open in receptivity to the plant world, it responds. When we learn to trust that response, we learn to heal." ----Geflügelete Worte, die nicht mehr eindeutig zuordnbar sind: entweder es stammt von Karl Valentin (was mir gefällt, weil ich Österreicher bin) oder von Niels Bohr (was mir noch viel mehr gefällt, denn ich sehe mich eigentlich - in der Tradition von Diogenes von Sinope - als Weltbürger, vor allem aber als Physiker! Die Version, die mir angesichts der derzeitigen geopolitischen Frage weniger gefällt, ist, dass sie von Mark Twain stammt. Egal, wahrscheinlich stammt das Bonmot ohnehin von einem dänischen Politker, den niemand kennt. "Man merkt, das man wirklich alt geworden ist, wenn der Anführer eines Landes jünger ist als man selbst. Zum Glück ist das bei mir in allen Ländern der Welt noch nicht der Fall, außer in Nordkorea und Österreich." "Deine Reime, Koze, das sind gute Reime, erlesene, ganz feine Reime! Sach mal, wo hast'n die her?!" Hab ich gesagt: "Ja, das is, hab ich selber mir ausgedacht!" Und dann meinten die: "Ja, so ist gut!". Siehste"
Zuletzt geändert von ungelesene_bettlektüre am 19. Jan 2019, 14:17, insgesamt 1-mal geändert. Der Merge von Kim Jon-Un mit Sebastian Kurz oder das kleine Bild? Das kleine Bild vom Poster bin offensichtlich ich - erkennt man nicht die Ähnlichkeit mit meinem Avatar hier? Und ist Dein physischer Körper nicht identisch mit dem Bildnis, das Du hier als Avatar trägst? Meinen wahren Namen habe ich rausgelöscht. Wenn ich besser mit Paint umgehen könnte, wollte ich eigentlich "Mag.rer.nat. usb137" dort einsetzen, aber wer hat schon die Zeit dazu? PS: ich trage übrigens ungefähr gleich selten Krawatten wie sterile OP-Bekleidung. ist Dein physischer Körper nicht identisch mit dem Bildnis, das Du hier als Avatar trägst? Ach so, eine weitere Rolle von Sasha Baron Cohen. Ach so, daher kommt auch Dein Nicknahme. "Das wahre Glück ist: Gutes zu tun." Sokrates !!! So wahr. In welcher Sprache - Latein? weil dein unteres bild is dochn pilz? Es sind beide Bilder Riesenboviste (Calvatia gigantea, Syn. Langermannia gigantea, Lycoperdon gigantea). 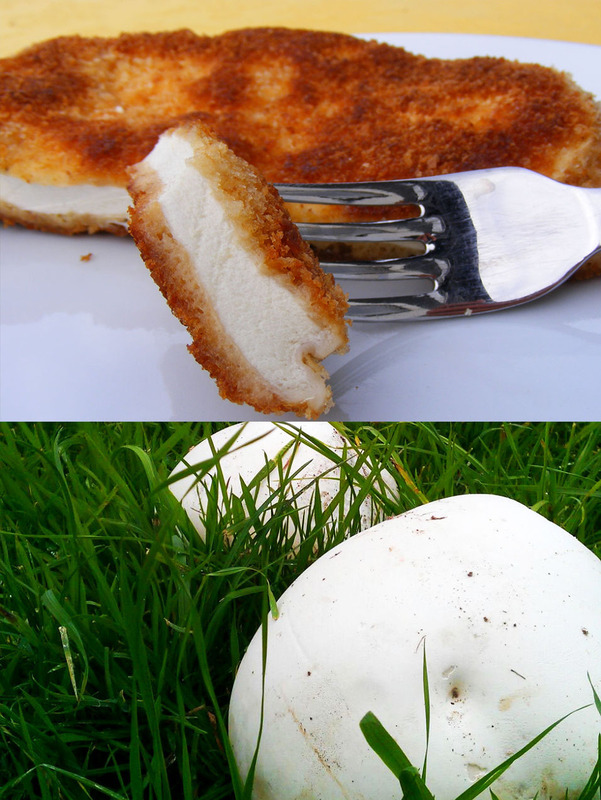 Der untere in der Natur, der obere zubereitet wie ein Wiener Schnitzel!